Software audits are, in practice, much like they sound: intimidating, inconvenient, and downright disruptive—especially if Adobe® is the initiator. The company is notoriously thorough and strict with their audits, and Gartner reports that they have ranked among the top three for audit frequency over the past 5 years. Would you be ready if they came knocking on your door tomorrow? 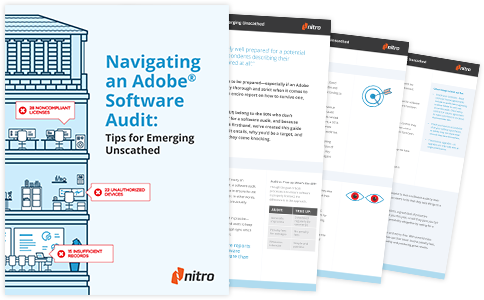 Don't be a part of the 85% of organizations who are unknowingly violating license compliance policies—download our guide to understanding the Adobe audit process and learn what you can do to prepare. What an Adobe software audit entails, and whether you could be a target. Tips for maintaining license compliance. How a full-blown Adobe audit could affect your organization.